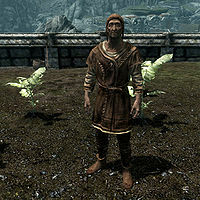 Rogatus Salvius is an elderly farmer who lives in the farmhouse at Salvius Farm, located just outside the Markarth city walls, with his wife Vigdis. He is the father of Leontius Salvius. He wears a belted tunic, some boots, and a hat. He wields an iron dagger and carries a key to his farmhouse, and a selection of common loot and gold. He wakes up at 8am and immediately goes out to the field to work. He works for twelve hours until he heads home at 8pm, and then goes to sleep at midnight. He has a pretty negative demeanor, and will often bitterly remark things like, "I've lived through rebellion, Forsworn, undead, witches, wizards, hagravens, and marriage." or "Next thing you know there will be some kind of damn blight and undead will walk the land." or "I'm been farming this bit of land all my life." or, lastly, "You ever have to farm land while there was a battle going on? I have." If you tell him you're looking for work, he'll bluntly point you to Markarth, saying, "What've you been staring at your feet this whole time? You see that big city up ahead of you? Markarth? Head over there, unless you feel like helping my wife pick crops. And then 50 years later you'll wake up and still be here." If you ask if he's been here long, he'll say, "What kind of question is that? Look at me! Is this a young man's face? I've been here 50 years, and nothing is going to move me off my land." He might also mention his son, ranting, "My boy Leontius lives in Old Hroldan. Damn drunk." If you ask for confirmation that his son is in Old Hroldan, he'll continue his rant, "That's right. Old inn to the south. The oaf doesn't even bother to visit these days. What am I supposed to do if the dragons burn down the farm? You're a traveler, right? I have this letter for him. Let him know how much of a failure he is." If you decline, he won't be surprised, remarking, "Typical. Well don't mind me, then." If you accept, he'll hand you the letter and say, "Good. You make sure the lug tips you when he gets it." This page was last modified on 25 January 2015, at 05:45.